76 other birds have this item in their bag or wishlist! Welcoming the Rock Bracelet from Greenwood Designs. With two varying neutral colours, these edgy bracelets will finish off your look with ease. Cute, comfy, elasticised and stylish. Love it. 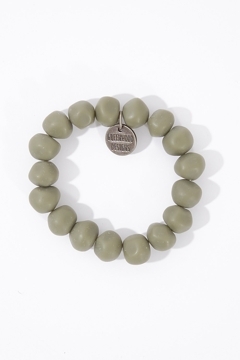 This simple bracelet is comfortable and has a very nice earthy color. My toddler keeps stealing it. Lovely colour and goes well with different outfits.